Mod is now available in two different versions. v1 bases your children on your spouse. You can choose hairstyles and skintone via the config file. v2 allows more freedom in how your children look, letting you mix and match the recolors. 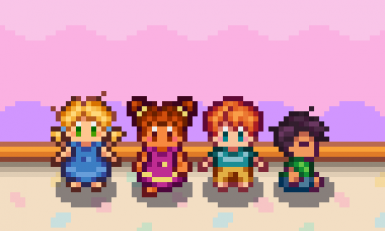 You can choose skintone, hairstyle, and character your child is based off of for each gender separately via the config file. Recolors not based on a spouse will only be available in this version. Requires Content Patcher﻿ and SMAPI﻿. Extract the mod folder into your Stardew Valley\Mods directory. There is a text file included with both versions instructing you on which values work with the config file.